They were both female, both royal by birth and both queens in their own right, but being cousins is what caused the most havoc in the lives of these two women. I am of course speaking of Elizabeth Tudor and Mary Stuart. It wasn’t only the fact that the cousins practiced different religions but that one was declared illegitimate in 1536 after the execution of her mother, Anne Boleyn. Had Henry VIII legitimized both Mary and Elizabeth Tudor when he added them to the line of succession things may have turned out very different for Mary Stuart. In this post I will not go into full detail on the cousins lives but will try to understand their relationship a bit better and show the differences in the two women. Do you believe that Elizabeth truly saw Mary as a threat to her throne? Or was it her advisors who made her believe it? Mary Stuart became Queen of Scotland at only six days old, after the death of her father, King James V.
Elizabeth Tudor became Queen of England at twenty-five years old after the death of her sister, Queen Mary. Elizabeth, nine years older than her cousin was Protestant, while the younger Mary was a staunch Catholic. Religion became the force between the two queens that would ultimately lead to the execution of Mary Stuart. Mary Stuart had been of queen of two countries, by birth Scotland, and by marriage France. Mary wed Francis, the dauphin of France on the 24th of April 1558 at the cathedral of Notre Dame. Something not many people know is that Francis was given the crown matrimonial upon his marriage to the Scottish queen. This made him the King of Scotland. Upon hearing this the very powerful Hamilton family in Scotland joined the Protestants to oppose the decision to make Francis the King of Scots. The Hamiltons were heir apparent to the Scottish throne should Mary die without issue – they had a vested interest in the matter. In the two years the young couple were married the Scottish crown never arrived in France. During the last illness of Queen Mary I of England in November 1558, the Valois family in France, or King Henry II to be more specific, saw Mary Stuart and his son Francis as the Catholic heirs to the throne of England. As stated earlier, Queen Mary was Catholic while her cousin Elizabeth was a well-known Protestant. As the great grand-daughter of King Henry VII, King Henry II of France had convinced the young Queen that it was her right to inherit the English throne should Queen Mary die. It seems that the 15 year old Mary did not fully understand how her claims to the English throne offended her cousin Elizabeth. By allowing those around her to claim the title of Queen of England she would start a battle with England that would end with her execution. In 1560, while Mary was still in France, a Protestant and anti-France uprising threatened Mary’s Scottish throne. English intervention on the side of the insurgents and the death of Mary’s mother, Mary of Guise, led to the Treaty of Edinburgh. With this treaty the French agreed to withdraw their troops that had been stationed in Scotland and agreed to recognize Elizabeth’s right to rule England. This left Scotland in the hands of a coalition that supported Protestantism. Mary refused to ratify the treaty which marked the end of the first stand-off between the two young queens: Elizabeth came out of it triumphant, while Mary was humiliated and incensed. Then in December 1560, Mary’s husband, a young man who had only been King of France for seventeen months died. The death of King Francis II left Mary a childless dowager queen of France. Catherine de Medici, a woman who practically raised Mary, made it clear that her home was in Scotland and not France. This must have been a scary time for Mary, she was just a child when she arrived in France and Scotland would seem foreign to her – her only choice was to return to her homeland. Elizabeth, who had only been Queen of England for two years, was concerned about her Catholic cousin’s return. This was solidified by Mary’s refusal to ratify the Treaty of Edinburgh. Because of this Elizabeth was furious and in turn refused Mary a warrant of safe passage through English waters upon her return from France. In the summer of 1565 things became more heated between the two cousins when Mary took as her second husband, her cousin (and Elizabeth’s), Henry Stuart, Lord Darnley. This new marriage did not please Elizabeth because he was also considered a possible heir to the English throne…which as she saw it (and her advisors) was a threat to her rule and her life. For those not familiar with Darnley’s heritage: He was the son of Margaret Douglas who was the daughter of Margaret Tudor, dowager queen of Scotland and sister to Henry VIII. Henry Stuart was Elizabeth’s first cousin as well as first cousin of Mary Stuart. Henry VIII had excluded his eldest sister’s family in the line of succession for an unknown reasons, but it could easily be because of the rocky relations between the two countries or Henry’s fear that both countries, England and Scotland could be ruled by a Scot, or worse yet, a ruler from Europe. By the following summer, the Scottish Queen became pregnant with who would later be King James VI of Scotland/James I of England. By this time Mary saw her husband for who he was: a drunk, womanizer and complete douchebag. Mary, in her ever dramatic fashion, had never hid her misery about her second marriage to the enemies of her husband. She was even quoted as saying by Scottish historian David Calderwood that, “unless she were quit of the king [Darnley] by one means or another, she could never have a good day in her life, and rather than that to be the instrument of her own death.”² — I love how dramatic all of Mary’s statements were. Then in February 1567, Henry Stuart was found murdered after an explosion at Kirk o’ Field. He had previously fallen ill with either smallpox or syphilis, depending on who you talk to, and was suggested by Mary to recuperate at Kirk o’ Field before returning to court. The night of Darnley’s death, Mary was attending a wedding of a member of her household. When Darnley’s body and that of his valet were found outside they were surrounded by a cloak, a dagger, a chair and a coat. Darnley was dressed in his nightshirt which had suggested that they fled his bedchamber in haste. Suspicion soon feel on James Hepburn, the Earl of Bothwell and Mary herself. Mary had been rumored to have a romantic relationship with Bothwell and Darnley’s death seemed far too convenient for many. In pop culture we often see Bothwell and Mary as a love story, but according to author, John Guy, the Earl of Bothwell never loved the Queen of Scots, he only loved the power she brought him. The fact that he dominated the couple’s relationship did not seem to bother Mary – she appeared okay with allowing him with all her cares, something her cousin Elizabeth would never allow. When Queen Elizabeth discovered that her cousin had not heeded her advice and went and married Bothwell, she was horrified. She had warned Mary that her new marriage was a threat to her Scottish throne. Mary’s response to her cousin was that she, Mary, could not rule Scotland alone (like her cousin) because she did not have the same authority that Elizabeth held in England. Mary must have believed she needed a man to be an effective Scottish queen. However, it wasn’t long before (it is believed) Mary Stuart saw the man before her for who he truly was, a man grasping for power. On the 24th of April 1567, Queen Mary was on her way to Holyrood after seeing her young son James, it was after that that she was forcibly taken by Bothwell to Dunbar where was “ravished”. Whether or not Mary was actually abducted and/or raped is still hotly debated. Everything about her relationship with Bothwell was unliked by her counselors and so if she wanted to make herself look better she very well could have made up the entire story. Only a few months later, in June of 1567, Mary was forced to abdicate her throne. After twenty-five years as Queen of Scotland she gave it all up. Her son was now King James VI of Scotland. After being threatened and forced to sign she was quoted as saying, “When God shall set me at liberty again, I shall not abide these, for it is done against my will.”4 Mary did not know before signing that her cousin Elizabeth had been planning a war to defend her. Mary was locked up at Lochleven Castle and was accused of adultery and murder and was said to be unfit to rule. When Elizabeth was informed of what had happened she was furious. If one queen could be forced to abdicate, why couldn’t she be forced to do the same? Elizabeth immediately sent for Cecil and lectured him for not being able to help Mary. Elizabeth threatened to declare war on Scotland again because Mary was an anointed queen, accountable to God alone. She wanted to demonstrate that a similar action in England would not be tolerated. Cecil warned her that a war with Scotland may cause the those against Mary to assassinate Her- he also knew that Elizabeth’s anger over the matter would eventually subside. When Mary eventually settled into her new way of life her ultimate plan was to get back all that she had lost. She spent her days at Lochleven Castle sewing, embroidering, playing cards, dancing and plotting. After eleven months of captivity at Lochleven, Mary finally found her freedom with the help of some of those employed by her captors. Mary raised an army that was larger than her brother, the Earl of Moray’s army, and she expected to defeat him and punish him for his greed. Unfortunately for Mary, it was her army that would be defeated. After riding for thirty miles at night she hid at the abbey in Dundrennan – it was there that she wrote an urgent appeal for aid from her cousin Elizabeth. With the letter she sent a diamond ring that Elizabeth had given her in 1563 as a token of love and friendship. Little did she know that Elizabeth had just purchased a bunch of Mary’s jewels from the Earl of Moray. Mary grew impatient and couldn’t wait for her cousin’s reply, she hopped on a fishing boat to cross the Solway Firth, landing at seven in the evening, near Carlisle, England. The following morning, Mary wrote a second letter to Elizabeth asking for her assistance in reclaiming her Scottish throne. Elizabeth was still sympathetic to her cousin’s cause but she also understood how dangerous it was to have Mary, a Catholic, in northern England. Cecil understood all too well the danger of Mary being in England and as soon as he heard he placed her under strict guard at Carlisle Castle. Cecil was determined to see Mary not regain her throne and show that she was indeed responsible of adultery and the murder of Henry Stuart. 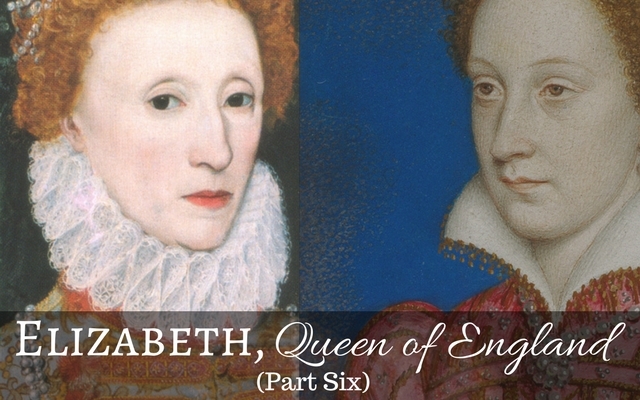 Within two weeks of her arrival in England, Mary understood that her future was in the hands of William Cecil, not her more sympathetic cousin, Elizabeth. For nearly twenty years Mary would remain Elizabeth’s prisoner, under the supervision of George Talbot, Earl of Shrewsbury. She was moved from one castle to another. Mary had consistently requested a face to face meeting with her cousin but that day never come – the two women would never meet. Mary’s downfall was the fact that she had become a figurehead for the Catholics in England. Unlike Lady Jane Grey with Queen Mary, it is believed that Mary had indeed involved in the conspiracies to remove the Protestant Elizabeth. Elizabeth’s spymaster, Sir Francis Walsingham had created a network of spies to intercept Mary’s letters. It was within those letters that Mary was caught plotting to kill Elizabeth. Mary was found guilty at her trial on the 25th of October 1586 and it wasn’t until the 1st of February that she finally signed the death warrant of her cousin. The decision could not have been an easy one for Elizabeth, she always appeared sympathetic to her cousin but ultimately understood that she must protect her own throne from a usurper. On my journey to discover who Elizabeth truly was I can honestly say that the only thing that changed my mind a bit was that she appeared sympathetic to her cousin Mary and the situations she found herself in. Do I now feel that Elizabeth was the best Tudor monarch? No. I still reserve that spot for Henry VIII. But I do understand a little better why so many of you do.